Some of you may recall the old 1980’s television show, MacGyver, with Richard Dean Anderson. It’s about a secret agent who uses simple everyday items in unconventional ways to thwart evil. First of all, I’m not smart enough to think of this on my own; the idea is from the smart people at Oxo. Oxo is a brand I trust. They make quality innovative products that make everyday life easier. I use many of their kitchen tools in my personal chef business. As you already know, spiralizing vegetables to produce more healthful meals is one of the hottest cooking trends to hit kitchens in a long time. Numerous spiralizers already exist on the market. However, Oxo studies people and how they use everyday products and improves upon them. They’ve developed the Oxo Good Grips® Spiralizer and it’s awesome! The super-sharp color-coded blades are stored in a blade box to keep them clean, safe and organized. The blade box fits neatly on board the spiralizer when not in use. The Stronghold™ suction cup underneath the spiralizer provides non-slip stability on countertops and has a lever that easily engages and releases the suction. The food holder has sharp teeth to securely hold the food in place. The rotating handle has a curved contour that fits easily in your hand. The side handle which helps advance the food through the blades folds up for compact storage. 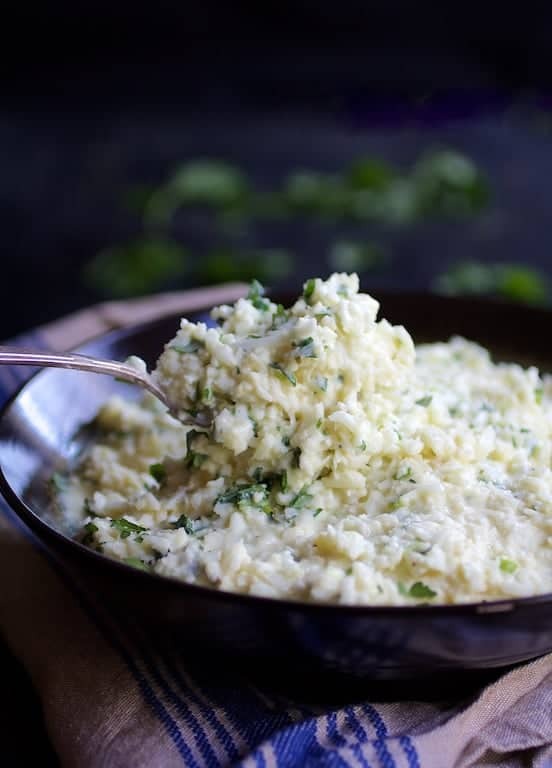 More and more of my clients are requesting healthful alternatives to rice, pasta and because I’m in the South–grits! I’ve made cauliflower grits and cauliflower rice with both food processors and hand graters. The problem with a food processor is that it’s very easy to practically puree the cauliflower as cauliflower contains a fair amount of water. 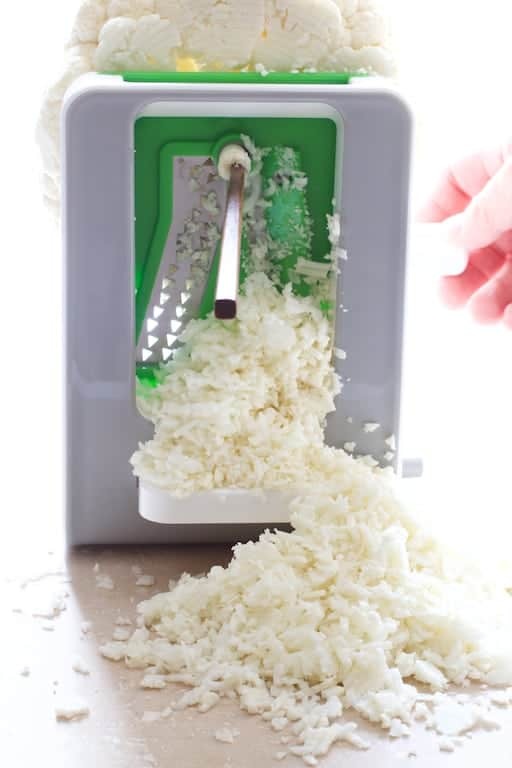 A hand grater works much better, however, it’s a lot of work and by the time I’m finished grating a head of cauliflower, my arm and shoulder are extremely tired. 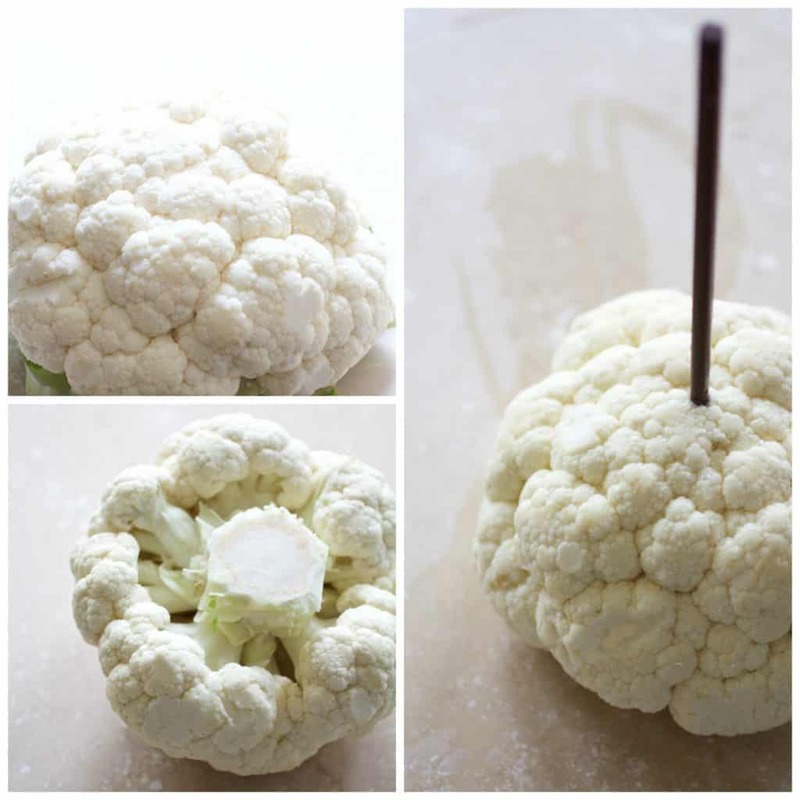 Start with a fresh, crisp snowy-white medium to large head of cauliflower. Remove all the leaves, but do not cut off the stem. Then, insert a long chopstick into the center of the top of the cauliflower. Using the fine, spaghetti-cut blade, place the chopstick through the hole that’s near the top of the blade. 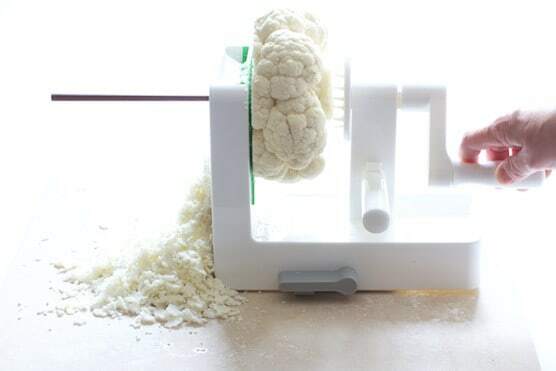 Secure the cauliflower with the food holder and spiralize away! Once the cauliflower is processed through the spiralizer, use a chef’s knife to finely chop it into small even “grains.” If any cauliflower florets left near the stem are difficult to pass through the blade, simply hand chop them along with the rest. 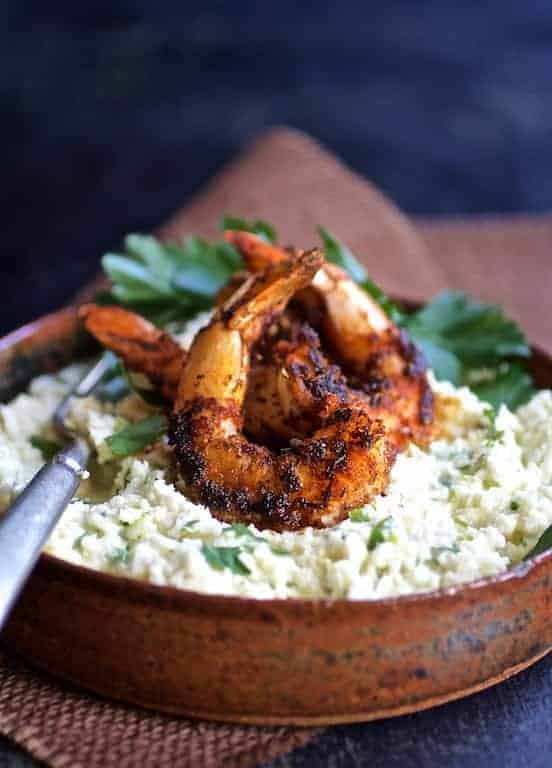 Now onto the rest of this creamy, cheesy wonderful low-carb Cauliflower Grits with Gouda Cheese and Blackened Shrimp. As I’ve mentioned in previous posts, I just couldn’t wrap my mind around “grits” when I first moved to the South and now I’m somewhat of a fanatic. I love being able to create a healthier version of the dish I’m so passionate about more easily with the Oxo Good Grips® Spiralizer. I use reduced-fat cream cheese blended with chicken broth rather than cream or half-and-half to produce a creamy base for the “grits.” Because gouda is a full-flavored cheese, you don’t need much. The amount of gouda cheese melted in at the end amounts to only 1/4 cup per serving. That’s not bad and cheese is a good source of calcium. ….Aaannnd……What are grits without shrimp? 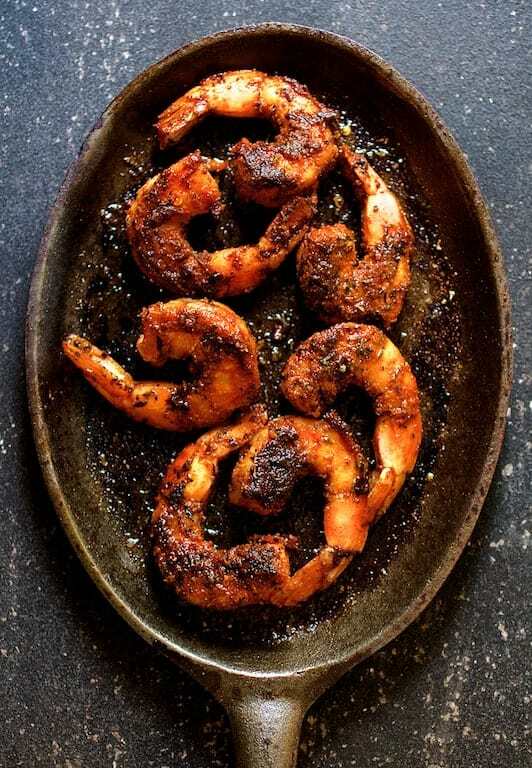 These blackened shrimp with my amazing homemade blackening mixture sear up easily in a cast-iron or nonstick skillet and pack a ton of flavor without a heavy sauce. The recipe for the blackening mixture makes more than you’ll need for the shrimp, but once you try it, you’ll always want to have it on hand! Enjoy! If you’re in the market for a spiralizer, give this one a try! What will you spiralize today? BLACKENING MIX: Combine spice mixture in a small bowl. Set aside. CAULIFLOWER GRITS: Process the head of cauliflower through the Oxo Good Grips Spiralizer as shown, then finely chop if necessary. Set aside. Heat butter in a shallow saucepan over medium-high heat. Add scallions, reduce heat to medium and cook 1-2 minutes to soften. Add chicken broth and bring to a boil. Whisk in cream cheese, stirring constantly until cream cheese is incorporated into the broth. Add the cauliflower and cook 2-3 minutes, stirring often. (I like them a little less cooked--you may like them cooked more.) Add the Gouda cheese, continuing to stir until the cheese has melted and cauliflower is a creamy consistency. Season to taste with salt and black pepper. Stir in parsley and keep warm. SHRIMP: Generously coat the shrimp with the blackening mix. Heat olive oil in a cast iron or nonstick pan over medium high heat. Add the shrimp and cook 1-2 minutes per side or until firm, being careful not to overcook. Serve grits topped with shrimp. Thanks so much, Vanessa! Your comment is a great start to my day! Thanks so much for the carb information. I’m in the process of adding nutritional information to my recipes. However, it’s a slow process so I’m sure my readers will appreciate the information. Thanks again and glad your fiance enjoyed too! I don’t understand with this ingredient list how it can be 29 carbs per serving? Could you explain that please. Th is so much! Hi, Marsha, Thanks so much for your question. The recipe program I use does the analysis for me. I actually don’t like providing a nutritional analysis because the only way to have it be accurate is to do it product by product and ingredient by ingredient. Everyone is going to use different products and cook things differently. Looking at the list, it most likely is not accurate. If carbs are a concern, I would suggest analyzing it using the Self [Magazine] Nutrition Data. http://nutritiondata.self.com/ Thanks again! I got to make this!!! I just got back from the store, but think I’ll go back to get some gouda and shrimp. I have everything else. Really gorgeous photos!! These look just fantastic. I make some cauliflower grits, but a different recipe. I’m definitely going to give this a try soon. Thank you for posting! Never had shrimp and grits but I LOVE this recipe! Beautiful pictures, very clear and thorough explanation. Awesome job! I love shrimp and grits! This sounds so good! Yum! 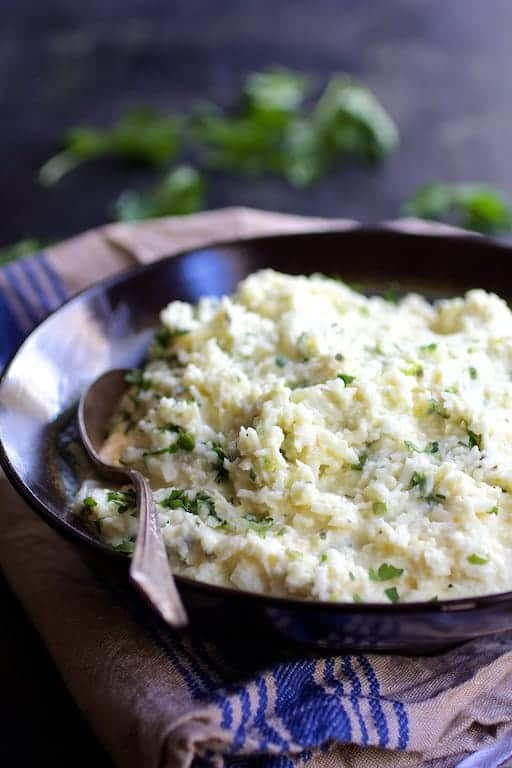 I think it’s time for me to venture into the world of cauliflower grits! I discovered shrimp and grits visiting relatives in North Carolina – and became a total fan! The gouda adds wonderful depth – I’ll have to try that! This looks so good, and I am craving it badly. Totally my type of dish! Can’t wait to make it! I love your seafood recipes! Awesome ideas! Gorgeous dish, love that spiralizer! The shrimp looks to die for!